IMA’s Annual Conference & Expo (ACE2019) is coming to beautiful San Diego to celebrate 100 years of IMA® (Institute of Management Accountants). Be a part of this milestone Conference, which features an epic party in honor of IMA’s centennial, fun networking events like the IMA Membership Mingle, and a spectacular lineup of keynote speakers. ACE2019 makes it easy to earn the CPE credits you need. Register now and enter promo code MACPA20 at checkout to get a special 20% discount for MACPA (Maryland Association of Certified Public Accountants) members. 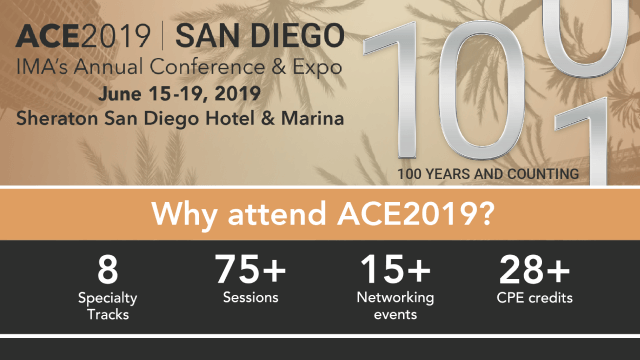 We’re excited to see you at ACE2019! P.S. Download this letter to help convince your boss to let you attend ACE2019.